PriceTarget Research’s Value Trend Ratings — quantitative ratings of relative attraction for 8,000 stocks — are updated weekly. These Value Trend Ratings combine a stock’s current appreciation potential as reflected in its Appreciation Score and current market dynamics as measured by its Power Rating. Our rating methodology recognizes two realities. First, as fundamentally based and meaningful as the Price Target and resulting Appreciation Score are, the underlying forecasts can be “off the mark” in some cases. Second, as important as technical measures and the Power Rating can be for a company, they can sometimes carry too far, “overshooting” warranted value, and resulting in an unusually speculative investment. By combining deep fundamentals and market factors, the Appreciation Score acts as a “governor” on the Power Rating during periods of high investor enthusiasm and the Power Rating can signal caution when market attitudes are out of line with forecasts and the Appreciation Score. Quadrant 2 stocks may well have forecasts that are too optimistic. Forecasts for Quadrant 4 stocks may be too pessimistic. The Overall Rating separates stocks selling below warranted value into those with the potential to get “less cheap” sooner (Quadrant 1) versus those with little likelihood of a significant price move over the near to intermediate term (Quadrant 2). PTR’s proprietary research clearly establishes that the combination of a disciplined stock valuation framework and consideration of market dynamics yields results that are superior to those derived from either approach utilized separately. Overall Rating. Overall Rating is a letter grade derived from the combination of the Appreciation Score and Power Rating. Stocks rated as Strong Buy (A) and Buy (B) — 15% of the universe in each case — generally have high Appreciation Scores and high Power Ratings and are expected to outperform the general market over the following 12-24 months. Those rated Strong Sell (F) and Sell (D) (15% each) are expected to under perform the general market and generally have lower Appreciation Scores and Power Ratings. Stocks with Hold ratings (C) (40% of the universe) are anticipated to perform in line with the general market. Power Rating. The Power Rating measures the “timeliness” of a stock for purchase. 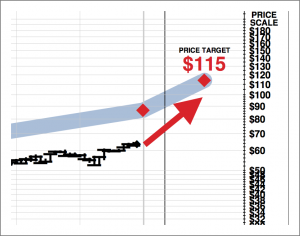 Because the Price Target, appreciation potential, and Appreciation Score are forecasts, other information is used to serve either as confirmation of the Price Target or to highlight cases in which the forecasts are not credible. (It includes the stock’s price performance, behavior of other companies in the same industry group, and the trend in earnings’ expectations. Percentiled relative to a universe of 8,000 companies. 0=the lowest power rating; 100=highest.) In the case below the weak Price and Industry Scores offset the higher Earnings’ Score resulting in a mediocre Power Rating of 34. Rating Results. In addition to the regular publication of its stock ratings, PriceTarget Research constantly assesses how well the Overall Ratings perform over prior periods. Performance for each rating category and the overall universe is measured over longer historical periods as well as for shorter intermediate periods with the focus on three key aspects of performance. The first is how well the ratings discriminate between outperforming and underperforming stocks — i.e., whether high rated stocks outperform the universe and low rated stocks underperform. The second consideration is how well-ordered this performance data is. Well-ordered performance occurs when A-rated stocks outperform B-rated stocks that, in turn, outperform C-rated stocks, and so on. Clearly, the most desirable outcome is for performance data to be well-ordered over the full period as well as for each individual year. Finally, persistence of ratings is measured. At each month end over the full historical periods, each stock’s rating is recorded and the number of subsequent months in which this initial rating was maintained calculated. 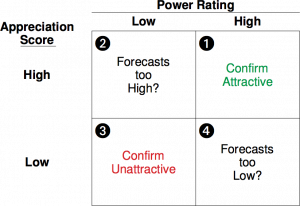 From this information, probabilites are developed that represent the likelihood that a specific rating (A, B, C, D, or F) would be maintained over future horizons. While past performance is no guarantee of future results, the evidence continues to indicate that PTR’s Overall Rating discriminates well between stocks that outperformed and stocks that underperformed over historical time periods. Moreover, this performance was well-ordered and consistently superior from period to period: in most years, A-rated stocks outperformed Cs and C-rated stocks outperformed Fs. Finally, the Overall Rating provided an exploitable, persistent appraisal of relative attractiveness: the average duration of individual ratings exceeded 12 months.